On the morning of Tuesday, March 22, three tragic explosions hit Belgium's capital city. The Brussels attacks began at 8 a.m. local time (3 a.m. ET), with two blasts at Brussels' airport killing at least 14 people and injuring over 80. Shortly thereafter, an explosion went off at the Maelbeek metro station, where 20 were killed, 106 injured, and 17 of those severely injured. The current death toll stands at 34. By 9 a.m. 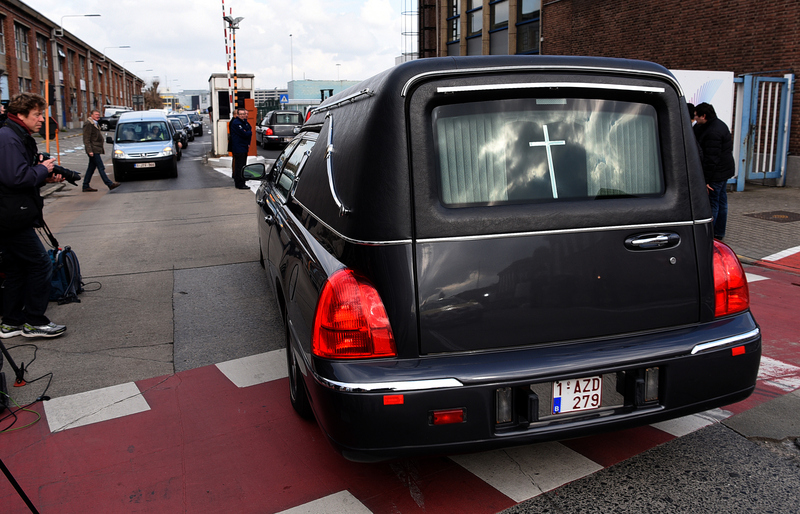 ET, images began surfacing of hearses lining up outside of the airport in local municipality Zaventem. And the sight is nothing short of a solemn one. Given that at least 14 individuals have lost their lives inside the airport, it's quite possible that the funeral cars are there to assist those who have lost a loved one, or offer their services and solidarity in whatever way is needed. However, no confirmation is available as to their presence. For the time being, they are serving as a poignant and somber reminder to those of us lucky enough to be in our homes, safe from the unfolding tragedy and its implications. In a video released by Bloomberg News capturing the moments after the airport blasts, we're presented with 18 seconds of chaos and despair — men and women fleeing the scene as quickly as possible as smoke rises from indoors. Although Brussels is currently in a state of lockdown, Prime Minister Charles Michel urging the population of Brussels to stay put, there are several ways to help victims. From hash-tagging #OpenDoor in order to invite displaced victims to your home to sending donations to the Red Cross of Belgium, services can be offered in this time of terror.